Carrie Underwood, You Can’t “Be” OCD! Ugh! Another person has diagnosed herself as OCD. Carrie Underwood said in a recent interview that she “is OCD about time.” It’s frustrating enough when anyone claims to “be OCD,” but Carrie is a huge celebrity and this will gain some attention. As tiring as it can be, I’ll never stop telling people that the “D” in “OCD” stands for disorder. 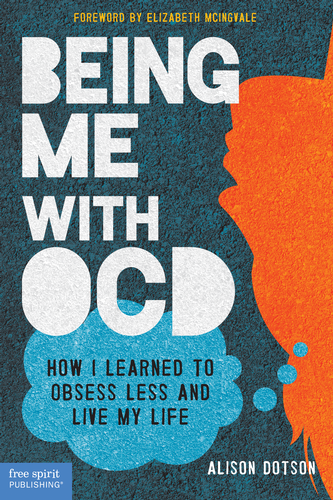 Statements like Carrie made trivialize OCD, making it seem like a minor inconvenience or a charming personality trait. And I am never sure I can believe it even when celebrities say they have OCD. It seems to be a pretty common claim to make, at least more common than claiming to have any other mental disorder. How do you respond when you hear someone say something like this? Do you let it go? Do you politely–or not so politely–correct the person? Leave a reply below! I’d love to hear from you. The following essay was originally published on The Huffington Post on March 7, 2013. In the latest episode of Girls, we learned that Lena Dunham’s character, Hannah, has obsessive-compulsive disorder (OCD). As someone with OCD, I find it refreshing to see this often misunderstood illness portrayed in a realistic way on an acclaimed television show. Just as Hannah herself resists typical far-fetched sitcom stereotypes —she’s not model thin, she struggles with her finances and her career choices, and she often finds herself in believable awkward situations—her OCD symptoms are presented in a way that resists the low-hanging fruit of a kooky character most of us never encounter in our day-to-day routine. Since my own OCD symptoms caused me so much pain that I considered suicide, it always irks me when the media presents OCD as a charming slapstick character trait. But while viewers may have chuckled once or twice as Hannah did everything in multiples of eight, the episode wasn’t out for easy laughs. Where did Hannah’s sudden counting compulsion come from? Why hasn’t it been mentioned before? One reviewer referred to this turn of events as “complete randomness” because the so-called recurrence of Hannah’s symptoms came on so suddenly. In the real world OCD symptoms can rear their persistent heads just as suddenly as Hannah’s did under the pressure of a book deadline. Mine certainly did—new obsessions would pop up at bedtime and stick around for months. But the symptoms aren’t always so obvious. Some people with OCD perform pretty obvious compulsions as Hannah did, or as Emma Pillsbury does on Glee, Adrian Monk did in eight seasons of Monk, and Melvin Udall did in As Good As It Gets. But others are “pure O,” meaning they only obsess, and if they do perform compulsions they are mental, not behavioral. You won’t see them excessively washing their hands, sanitizing their work spaces, skipping over cracks in the sidewalk, or flipping the light switch on and off (and on and off). My own pure O symptoms consisted of terrible and “wrong” intrusive thoughts that made me question who I really was. Throughout my childhood, teens, and early 20s I struggled with obsessions so dark and unconquerable they nearly ended me. My “harm obsessions” were especially difficult to overcome. I couldn’t shake the belief that I was capable of hurting children or a family member, and it became almost unbearable to be around the very people who made my life worth living. I fell into a deep depression, but other than seeming “a little down” to some especially insightful friends, no one would have guessed I had OCD. I didn’t even guess I had OCD. Equipped only with common media portrayals of the illness, it didn’t occur to me until my late 20s that I could have a treatable disorder. The reason we don’t see pure O portrayed in media is probably because filming a person quietly despairing over intrusive thoughts isn’t as interesting as filming a person with quirky behaviors. Viewers can laugh at a character who insists on perfectly aligning every book on a shelf, but watching someone go through mental torture isn’t very entertaining, or easy to portray. So we’re often left with what the entertainment industry is able to show us, and what people with OCD show us. I can’t tell you how many times I’ve heard people joke about OCD as though it’s charming or cute, as though the symptoms are desirable personality traits: “But he’s so organized! How can that be a bad thing?” And if I hear one more person say, “I’m so OCD!” I might have to knock them over the head with the DSM-5 (Diagnostic Statistical Manual of Mental Disorders)—and then open it to the OCD section so they’ll understand once and for all that the “D” in “OCD” stands for disorder. No one can be OCD; we can only have it. And we don’t usually laugh about it. Reading that pains me. I didn’t realize for nearly two decades that I had OCD. I just figured I was a really horrible person for obsessing about “taboo” thoughts. Even when people are properly diagnosed, the stigma surrounding mental illness in general often makes people feel too embarrassed and ashamed to take the medication that could turn their lives around. Girls is so highly acclaimed, and controversial enough to spark online discussions, that I hope Sunday’s episode will get everyone talking about OCD—the real OCD. Considering Dunham has talked about her own teenage struggle with it, that may be her hope as well.